The Kitchen Cabinet: BBC Radio 4’s successful culinary panel show. Jay Rayner chairs an expert panel who answers questions from audiences around the UK. I had the original idea for this programme and am its food consultant. Riverford: Well established organic vegetable box scheme operating across the country. 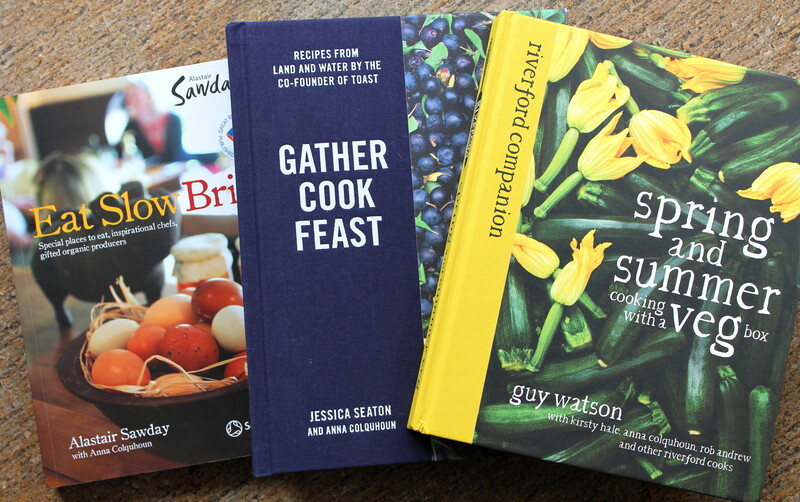 I have collaborated with Riverford for many years – running cooking classes, developing preserving kits and writing and editing their cookbooks, among other things. Gather Cook Feast: My latest book, featuring over 120 wonderful recipes evoking the landscapes of the British Isles, written with Jessica Seaton, co-founder of clothing brand Toast, and beautifully photographed by Jonathan Lovekin and Nick Seaton. Published in April 2017 by Fig Tree (Penguin). SOAS Food Studies Centre: I am doing a part-time anthropology PhD at the School of Oriental and African Studies in London, researching and writing about the social, cultural, political and economic dimensions to food. My research focus is the construction of a regional cuisine in Croatian Istria, where I am also opening a culinary guesthouse, Bolara 60. The Gift of Waste: A short book about Londoners’ varied approaches to cooking and reducing food waste, including recipes, useful tips and stories stretching from their London kitchens to Pakistan, Ukraine, Tanzania and beyond. My conclusion: a one-size-fits-all approach to reducing food waste will not chime with most people’s experiences, practices or values. Eat Slow Britain: My first book, published by Alastair Sawday in partnership with the Soil Association. Eat Slow Britain tells the stories of 88 British food businesses, from pubs to high-end hotels, artisan cheesemakers to pig farmers. Each business, in its own way, takes a ‘slow’ approach to food. The Highbury Cookbook: A project in partnership with my fabulous local greengrocer, Mrs Lovell, who has since tragically passed away too young. We had been collecting recipes and stories from cooks in the Highbury area of London to capture the feel of the community connected to the shop and its ties all around the world.